Have I mentioned how much I love roasted veggies? I know I've posted like a gazillion roasted vegetable recipes, but I found another good one and I just have to share! Do y'all love roasted veggies as much as me? I could eat roasted curried cauliflower by the handful, like it's chips or pretzels or something. And this broccoli? 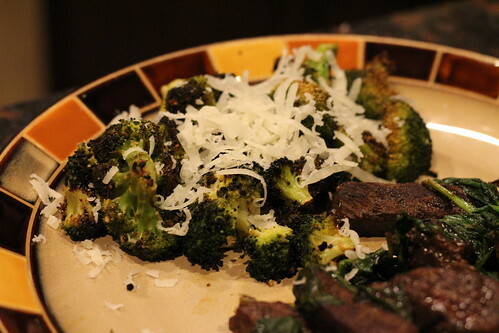 It's tied for the prize of "BEST BROCCOLI EVER" with the parmesan roasted broccoli recipe. Manchego is one of my favoritest cheeses ever, so I knew this was gonna be good before I even tried it! Recipe adapted from here. Ingredients: 1 large head broccoli (about 1 pound) 2 cloves garlic, minced 1 tbsp olive oil 1/8 to 1/4 tsp red pepper flakes (depending on how hot you like it!) salt 1/2 tbsp freshly squeezed lemon juice 1/4 cup grated Manchego cheese Directions: 1. Cut broccoli into florets and discard stalks. 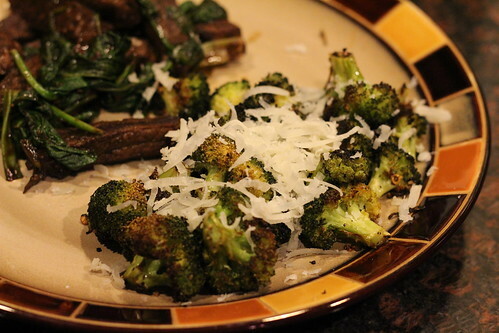 In a large bowl, combine broccoli florets, garlic, olive oil, and red pepper flakes. Mix well. 2. Line a rimmed baking sheet with foil. Spread broccoli mixture onto the baking sheet. 3. Roast at 450 for 20-25 minutes (or until broccoli is tender and beginning to brown), tossing halfway through. 4. 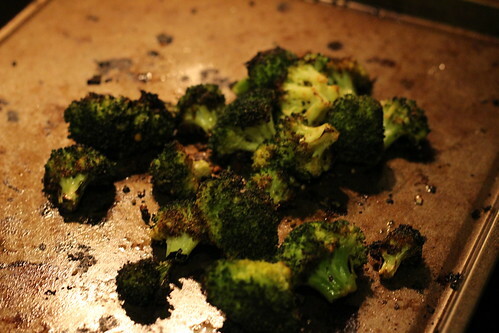 Sprinkle broccoli with lemon juice and toss to coat. Serve topped with grated Manchego. I forgot to take a photo until I had already scooped most of the broccoli off the baking sheet, but this is what it looks like after being roasted... Ta-da! Enjoy!